Whenever we go anywhere new, a holiday somewhere in the UK, the first thing we look for is a zoo. 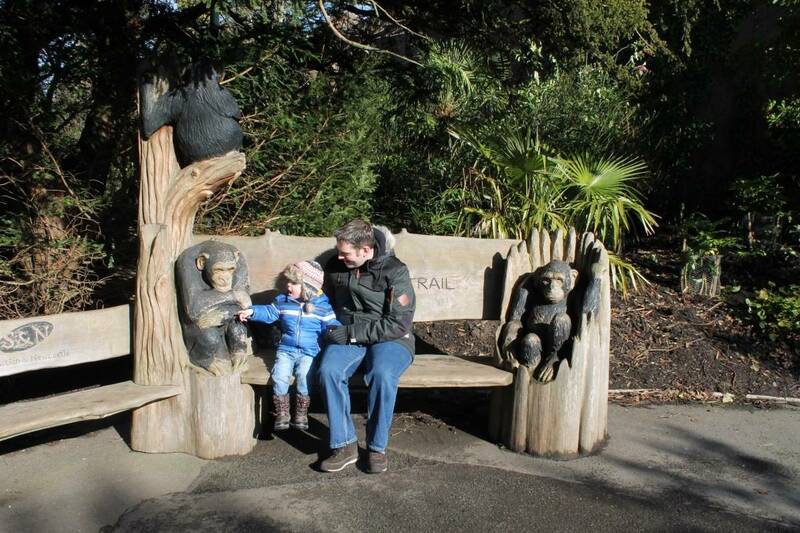 The children love zoos and they are always such a great family day out so when we spent half term in Scotland we just had to go to Edinburgh Zoo – and crossed our fingers that the weather would be ok. In the end we had a lovely bright, crisp winter’s day for our visit to the zoo. 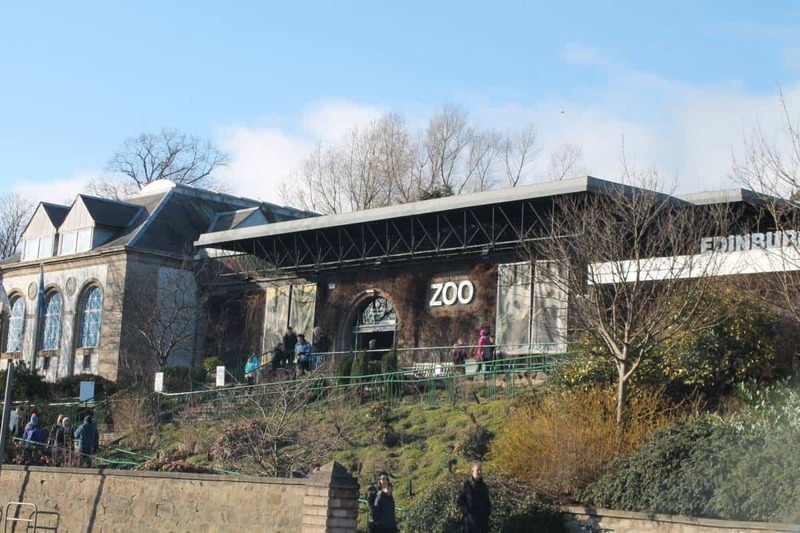 Edinburgh Zoo is situated in a really random position, on a main road, next to a Holiday Inn in Edinburgh and sadly, like so many other tourist attractions, they charge £4 to park on top of the admission fees. When we purchased our tickets we were asked if we would like to book a time to see the pandas – as they’re the only pandas in the UK their enclosure is obviously really busy and so it’s ticketed with everyone given a ten minute time slot – we booked one in the afternoon, planning to see the pandas before heading home. 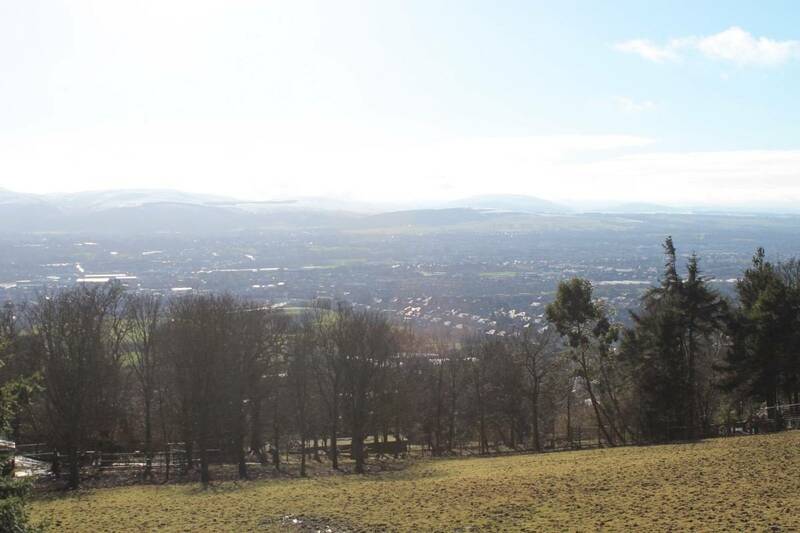 Our first thought of Edinburgh Zoo was how hilly it was. Everything is on a hill but it’s great exercise! 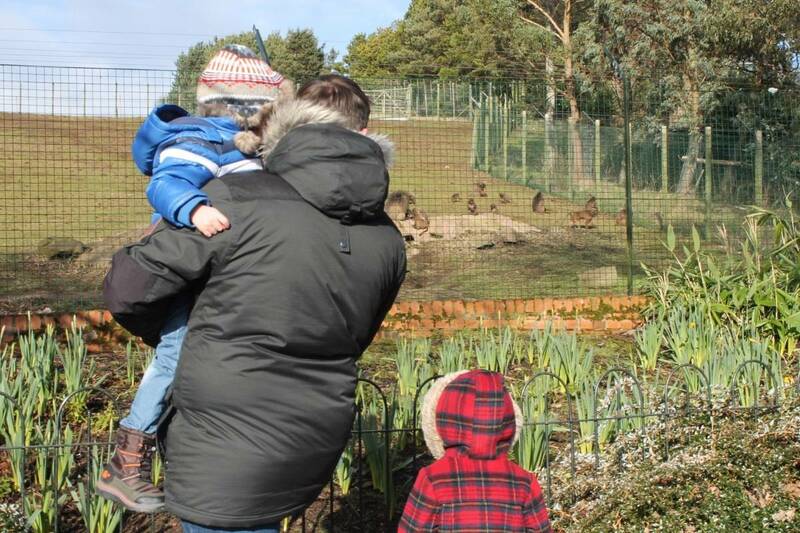 All of the enclosures were as natural and true to the animals’ typical habitats as possible and the children loved it – although I’m glad we took the pushchair! The first animals we saw were the meerkats, always a winner with the children and with large viewing windows to see inside. 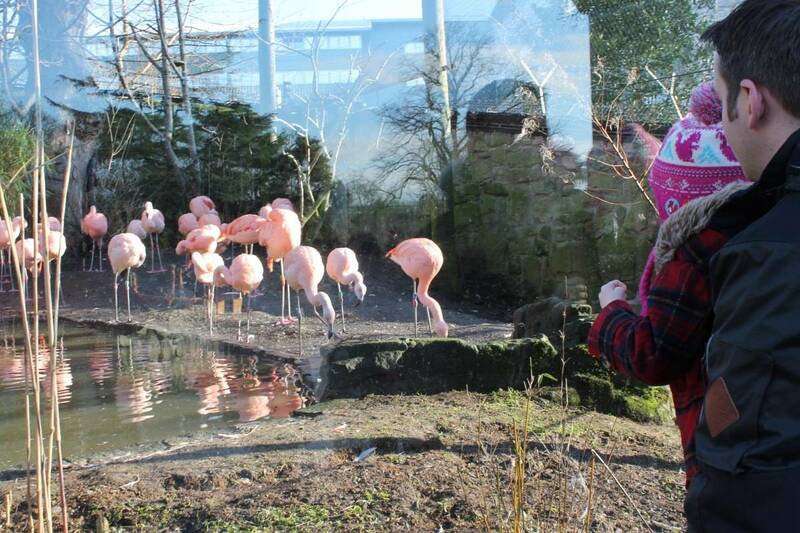 Most of the enclosures in Edinburgh Zoo had indoor and outdoor sections and big windows to make everything as easy to see as possible. Most of the animals were inside though – probably as it was so cold! 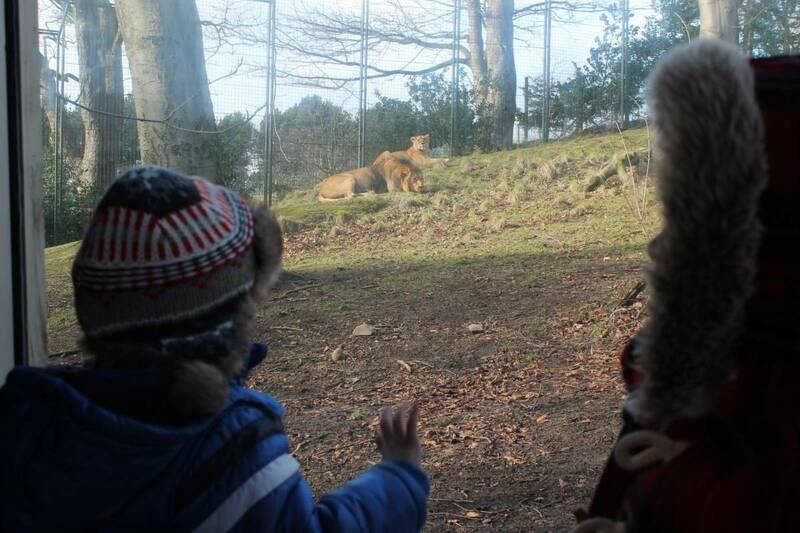 The children’s favourite animals were the lions, tiger and zebras who were all really easy to see. The lions especially were animals the children had both mentioned before we went to the zoo so we were pleased that they were laying pretty much in front of our window. 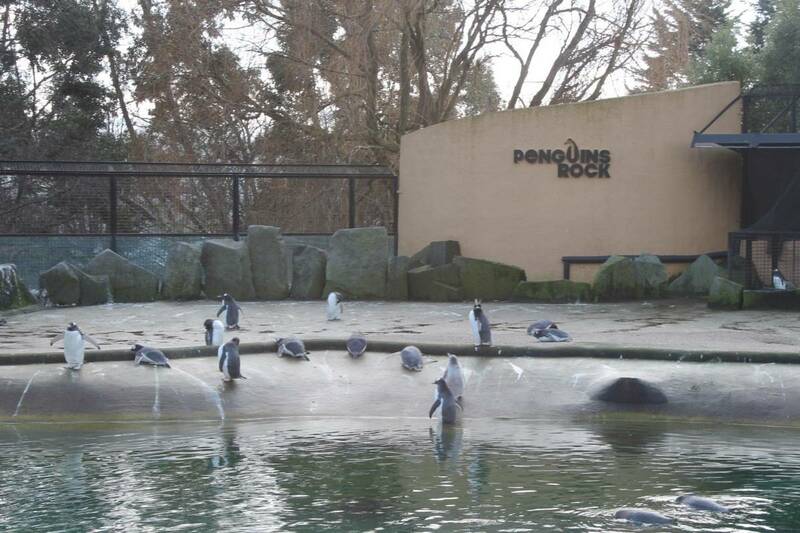 The penguins had a really nice big enclosure and came right up to the glass. They also had an underwater viewing section that the children loved. We had lunch at the Grasslands Restaurant that was really busy but the food was good with a lot more choice that typical tourist attractions. Hubby had macaroni cheese and chips, I had a pulled pork bap and chips and the children had half a full size pizza and chips. It was one of the best lunches we’ve had at an attraction in quite a while but there are also plenty of places to eat a picnic or packed lunch too. After lunch we went to see the pandas and were more than a little disappointed that due to building work going on the male panda had been given the day off and so wasn’t in his enclosure. The female panda was around but as she had access to the indoor part too – which we couldn’t see into – we didn’t get to see her – apart from her turning around in the entrance to the indoor part and obscured by a bush. 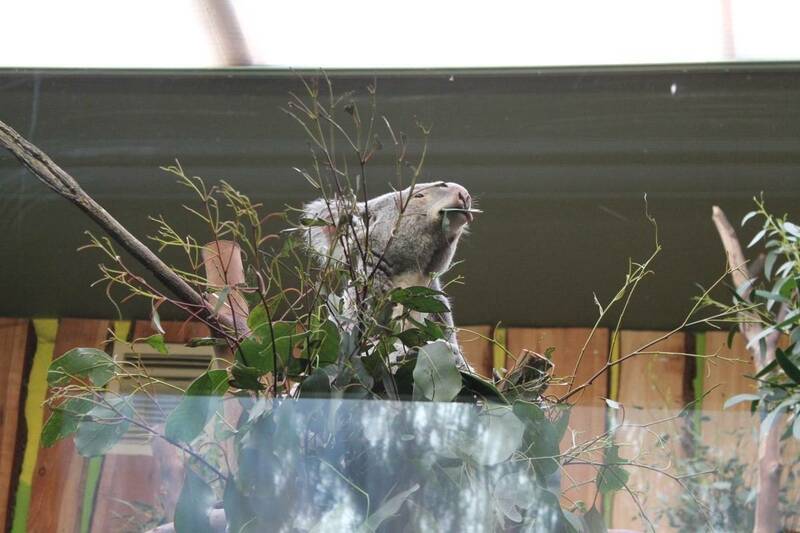 We did get to see koalas though – also the only ones in the UK but for some reason less popular than the pandas and without time slots to see them! We loved the koalas and could have watched them for ages! Before long it was time to head home but not before walking through the gift shop – the most expensive I have ever seen at a tourist attraction. The children each got a cuddly panda as a souvenir not just of Edinburgh Zoo but of our lovely Scottish holiday. Edinburgh zoo is ace! Much bigger (and better) than London zoo in our opinion. The restaurant is yummy! I agree about the panda hype. We saw both when we went but I think it would be fine to remove the ticket system now. I’m sure it was necessary when they first arrived. Very hilly though! We went in May from Manchester especially to see the pandas. We ended up seeing the male as the female didn’t fancy to be seen that day. 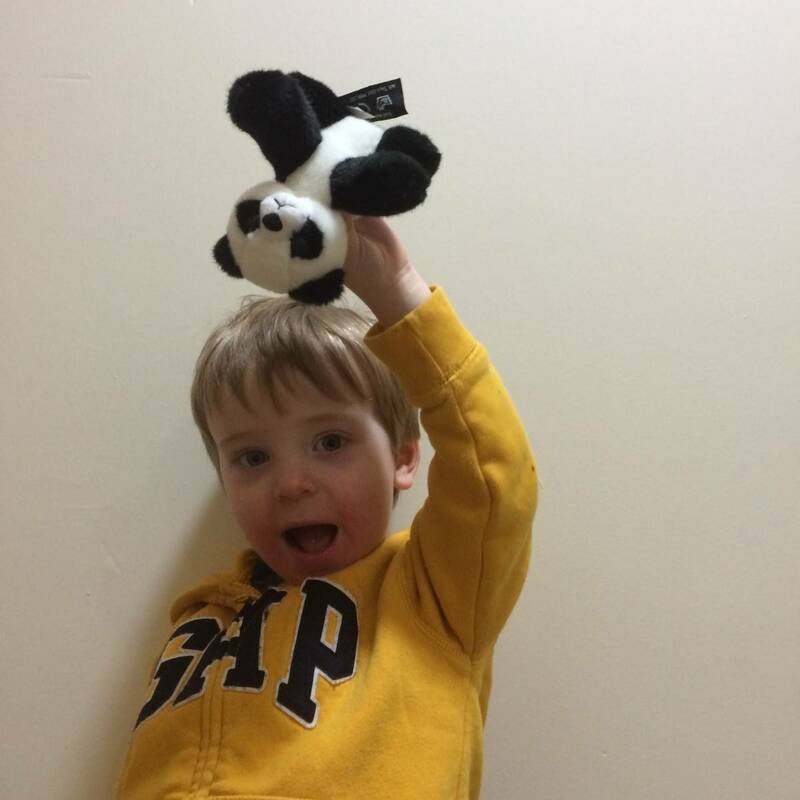 We were disappointed as the zoo makes a massive deal about seeing the pandas and you should be able to see them. Best bit was when the male poo’d it looked like corn on the cob! We also loved the koalas and felt they deserved more of a fuss than they get. 12 years I have lived here and I still haven’t been to Edinburgh list! It’s on our must-do list before we move. That is a shame that you didn’t get to see the pandas though.